This post is part of my ongoing series on author & book promotion, which is aimed at helping fellow authors build their audience and establish a platform to promote their work. Please join the mailing list to ensure that you don’t miss future articles. Book marketing in the digital age is a rapidly evolving beast. It is not just that the format of books has changed (with e-books accounting for 25% of trade sales), but the way that readers find new books to read. The majority of new books sold in the U.S. — independent of format — are purchased online. It follows that a significant amount of book marketing takes place online. There’s a misconception that social media is the best way for authors and publishers to promote their books. But ask any web marketing expert, and he or she will tell you that e-mail remains one of the most effective ways to drive sales. That’s why building your author mailing list is so important even before you publish. Building the list is step one. Using it effectively to sell books is the all-important step two. We have four contenders here, all with different positions in the market. Note, the links below will take you to their sign-up pages. BookPerk an e-mail service by HarperCollins that offers “e-book bargains, sneak peeks, special offers, and more– delivered straight to your inbox” in the form of a daily e-mail. 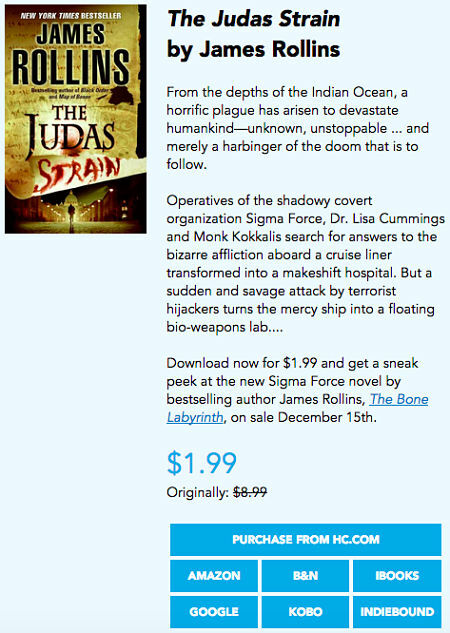 Tor.com, the relatively new digital-first imprint of a major SF/F publisher that focuses on novellas. This e-mail coincides with the official launch of their first titles, which has been the subject of a major promotional push for over a year. BookBub, a book discovery (for readers) and promotion (for publishers) e-mail service provider. 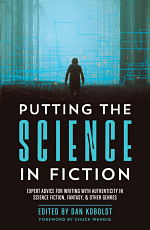 I’ve opted in to the “science fiction” and “fantasy” e-mail lists, so my daily e-mail usually has one selected deal (discounted/free e-book) from each genre. See also my BookBub analysis. Baen Books, a mid-sized SF/F publisher that publishes around 30 new titles per year. Note that their newsletter is aimed at promoting their print catalogue, whereas the others are aimed at selling e-books. Importantly, I have a relationship with all four of these companies: HarperCollins is publishing my debut novel The Rogue Retrieval. Tor.com is considering some of my shorter fiction. 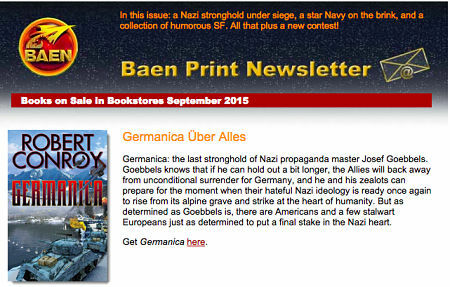 A close friend of mine works at BookBub, and I’ve agreed to contribute an article to Baen.com for 2016. Even so, I’ll do my best to be fair. Now, let’s examine how each of these different companies uses e-mail to promote and sell books. All three companies take a very different approach at the subject line. Tor.com’s subject line is like an announcement: it’s our publishing debut. There’s no real indication of what the body of the e-mail will contain, but with all of the marketing muscle that’s been behind this campaign, it would be hard for a reader not to know. BookPerk (HC) and BookBub use subject lines with a prescribed format, and I think they’re very interesting. Look at the powerful use of words here: ‘Your’ makes it personal; ‘perks‘ and ‘e-book bargains’ offer value, and ‘for Wednesday/Thursday’ adds urgency to the call-to-action. There’s a subtle thing going on here, too: these e-mails come (almost) every day, but the subject line reminds us that they’re expected to. It’s harder to be annoyed by something you asked for. Another note of some interest: I use the new tabbed format of Gmail, and all four messages went to the “Promotions” tab. I’d call this the correct behavior, though I’m sure the senders would prefer getting into my primary tab. Now, let’s look at the body of the e-mail, which is arguably the most important part of it. Here, I’m assessing the overall aesthetic appearance of the message, the length and diversity of content, and how books are presented. Now we have two panels of bite-sized content: on the left are the month’s book releases with cover, clickable title, and blurb (there were 6 total). 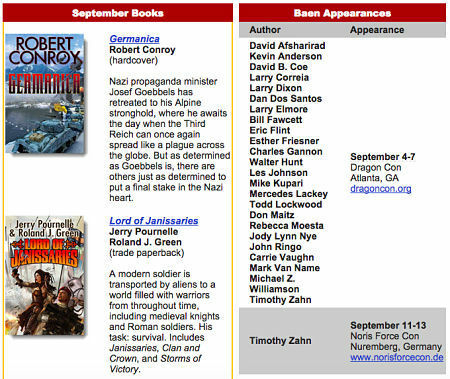 On the right, upcoming appearances of Baen authors. I love that they’re not only promoting the products but the authors as well. 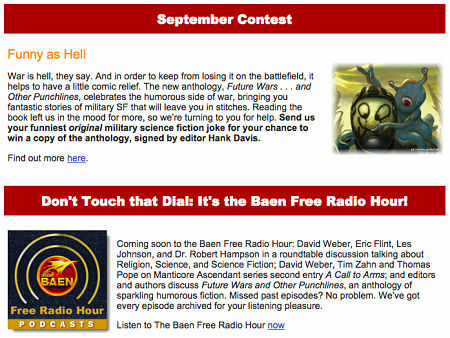 One starts to see why Baen enjoys superb loyalty from both authors and readers. The top of the e-mail has a beautiful graphic, a nice amount of white space, and an engaging paragraph that gives an overview of launch events. What impresses me the most is the call to action in the top right: forward to a friend. It’s a clever thing to ask, particularly for a newly established imprint. The issues here should be fairly obvious, first and foremost of which is brand confusion. A lot of readers (especially non-authors) may not know that Tor.com is owned by Macmillan. 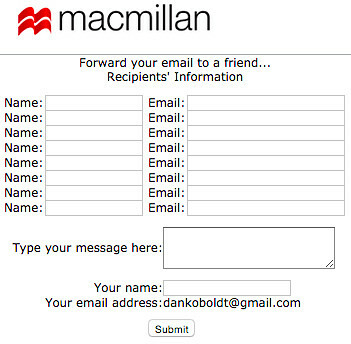 The page appearance is very basic, and the form asks for far too much information. As it stands, I would expect this form has a high abandonment rate. A striking and impressive cover image. Cover designs are just so important. All of the covers I’ve seen for Tor.com are fantastic. Concise book description and blurb from a similar author. This is the hook. It’s nice that they have a little About the Author section below, too, but they made the right decision to keep it out of the way. 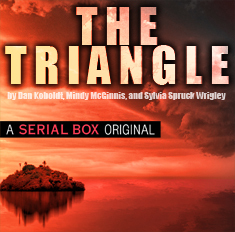 Multiple calls to action: you can read an excerpt, or buy it for any of the four top e-readers. You can even go get the paperback. I have to say, this is the most important part of the e-mail and Tor.com just nailed it. This book is normally $1.99, but today it’s free, as many Bookbub promos are. Spoiler warning: People like free! Not every daily deal includes a free book, but the fact that so many are keeps subscribers on the ever-growing lists. You’ll note many similarities to some of the other examples we’ve seen. The cover is professionally done. The book description is a bit meatier. Notice the considerable discount and the bonus content. These are buying triggers, things that convince a person to make the purchase right here, right now. 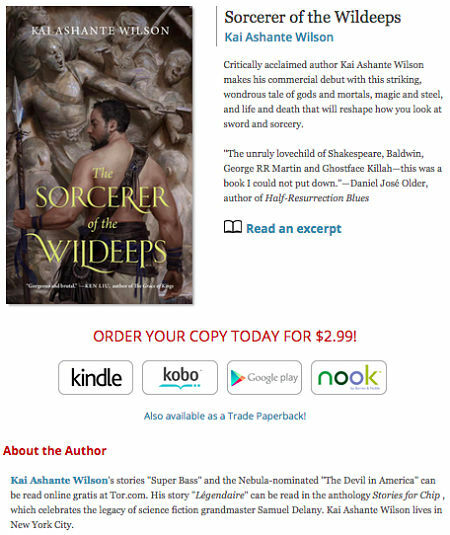 And bonus points to my publisher for including a buy button for IndieBound. 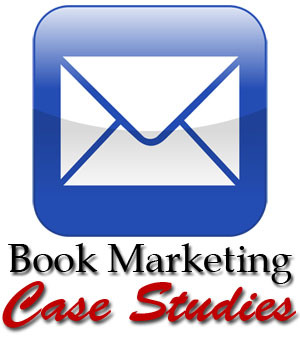 The subject line and e-mail body are arguably the most important parts of book marketing e-mails, but I was interested to see how these four companies closed out their e-mails. First, I wanted to check for FTC compliance: many authors don’t realize this (until they sign up for MailChimp or another provider), but FTC regulations require that any message sent to a mailing list include an unubscribe link, the identity of the sender, and the sender’s physical address (no P.O. boxes). That last one is what always surprises people. Authors are constantly warned to protect their own privacy — due to the number of crazies out there in the world — but then they’re required to give out their physical address. It’s a strange rule, and (to my knowledge), not strongly enforced. Even so, three of the four companies here provided their physical address, so they seem to take it seriously. 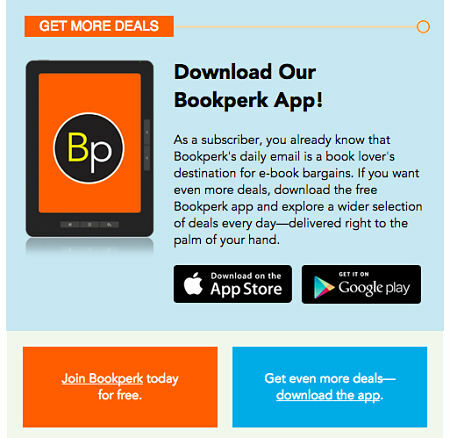 Though we can expect that the majority of e-mail recipients won’t read through to the bottom, BookPerk offers a tantalizing call to action for those who do: download our app to get even more deals. Not bad. Following that link brings up a nice page where one can invite friends by putting in e-mail addresses OR by providing your Gmail contacts. 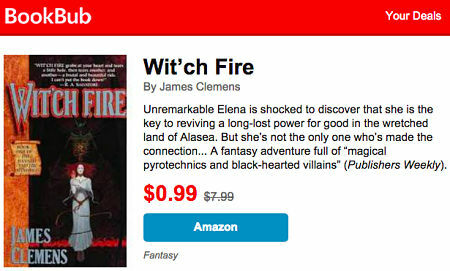 Unlike the Tor.com version, this one has a clear brand association in the Bookbub style. 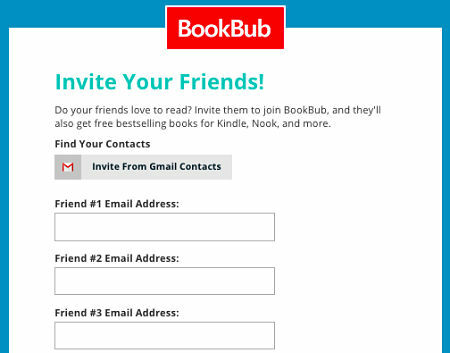 If even one out of every hundred visitors agrees to invite through Gmail, BookBub will reap tons of new potential subscribers. Growing one’s email list is just as important as making a sale, and I think BookBub is doing it well. Bottom line, I think we can agree that these four companies know how to promote and sell books. I certainly learned a lot while studying how they do so via e-mail, and I hope you did too.